The household appliance manufacturers are integrating their products with the IoT technology to make customers lives comfortable and convenient. Internet of Things technology is the interconnectivity of physical objects and devices that are integrated with sensors and software that allow them to exchange and collect data. Major technologies enabling smart household appliances include Wi-Fi, Bluetooth Low Energy, micro server and micro-electromechanical systems. For instance, LG has created homechat, an app that enables the user to monitor their refrigerators, cookers, washing machines and other devices from anywhere through their smart phones. The homechat technology was introduced by LG initially in South Korea and is moving to other global markets gradually. According to report by IHS, the global smart connected electronics shipments is estimated to be over 223 million by 2020. HOUSEHOLD APPLIANCE MANUFACTURING MARKET TO GROW TO $471 BILLION BY 2020 ACCORDING TO THE BUSINESS RESEARCH COMPANY. The Business Research Company expects the household appliance manufacturing market to grow to $471 billion in 2020. Asia Pacific was the largest region in the household appliances manufacturing market in 2016, accounting for $188 billion or 51.0% market share. Samsung Electronics Co. Ltd was the largest competitor in the electronic equipment market in 2016 with revenues of $30 billion for the financial year 2016 from Samsung’s CE Division, which includes household appliance manufacturing. Samsung’s growth strategy is to increase its share in the premium appliances segment. 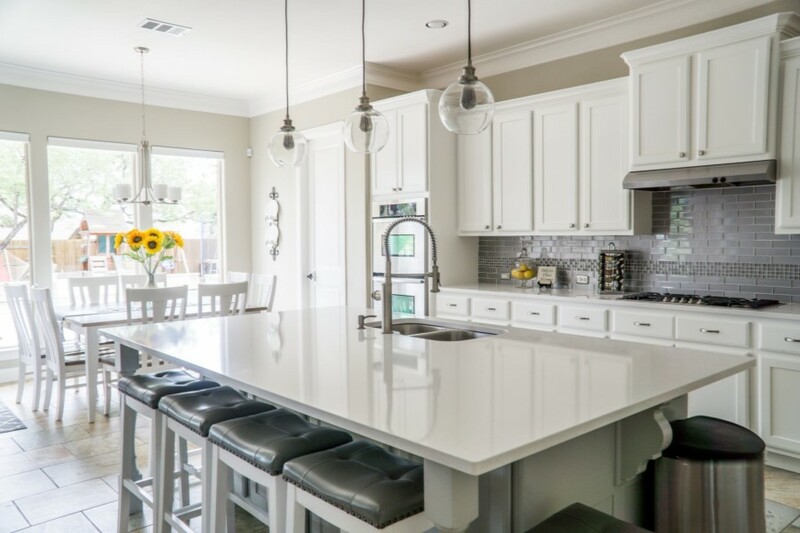 It acquired Dacor, a luxury appliance brand in the USA as part of this strategy. Household appliance manufacturing industry consists of establishments engaged in manufacturing of appliances used for various purposes at home such as household-type small electric appliances, electric and non-electric cooking appliances, refrigerators and home freezers, laundry equipment and other major household appliances. The chart below shows the year-on-year growth of the global household appliance manufacturing market during 2016 - 2020. The household appliances manufacturing industry can be categorized into the following Small Electrical Appliance Manufacturing comprise establishments manufacturing small electric appliances and electric housewares, household-type fans (except attic fans), household-type vacuum cleaners, and other electric household-type floor care machines. Household Cooking Appliance Manufacturing include establishments manufacturing household-type electric and nonelectric cooking equipment. Household Refrigerator And Home Freezer Manufacturing comprise establishments manufacturing household-type refrigerators and upright and chest freezers. Household Laundry Equipment include establishments manufacturing household-type laundry equipment. Other Major Household Appliances comprise small electric appliances, cooking appliances, home freezers and home laundry equipment. 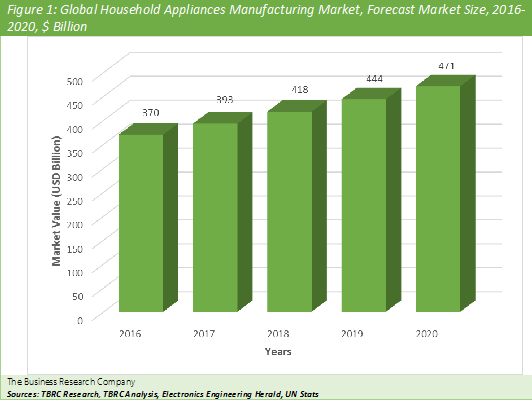 Household Appliance Manufacturing Market Briefing is a detailed report giving a unique insight into this market. The report is priced at $1000 for an individual user. To use across your office the price is $1500 and $2000 if you wish to use across a multinational company. About The Business Research Company Visit TheBusinessResearchCompany.com, mail info@tbrc.info or call +447443439350 or +918897263534 or +919160996838 for more information on this and many other titles. The Business Research Company is a market research and intelligence company, which excels in company, market and consumer research. It has research professionals at its offices in the UK, India and the US as well a network of trained researchers globally. It has specialist consultants in a wide range of industries including manufacturing, healthcare, chemicals and technology. The Business Research Company's management has more than 20 years of varied business research experience. They have delivered hundreds of research projects to the senior management of some of the world's largest organizations.